Cosmedico Cosmolux is luxury sunshine straight from the lamp. What is so special about the Cosmolux lamp range? High immediate tanning effect, long-lasting deep tan and shorter tanning times. In addition, there is also a longer-than-average useful service life and only a slight decrease in UV capacity relative to the period of use. How does it work? The tried-and-tested Cosmedico lamp technology and the use of a mixture of luminescent materials tailored to the target effect in combination with transmission defined by special bulbs. An example? The legendary Cosmedico Cosmolux VHR 9K90 with the original VHO long mount electrode and the impressive deep tan. 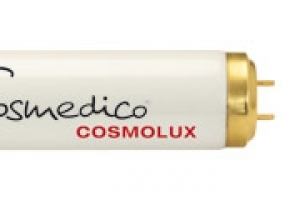 Cosmedico Cosmolux — you can’t squeeze more luxury into a tanning lamp!